SH!TSHOW is a caboose on the train of queer performing artists giving into their shameless impulses. We bring you our acts of self-creation and self-destruction to comfort you, disgust you, turn you on, make you feel connected, repulse you. Like our queer foremothers, we offer our tired organs to feed the soul that yearns for connection, stimuli, a chaotic world to reflect the chaotic self, an outward expression of love and anger to match the inward. Featuring a cadre of Baltimore artists and expatriates, SH!TSHOW meets one hungry city with another and bridges queers from across streets/ states/ stresses. Performers break the metes and bounds of genre, using fabric installation, costume, sculpture, dance theater, sound to break down the walls of the mundane and reveal the world’s guts. Revel in these guts with us. Performers include: Hoesy Corona, fabric artist and performer. Jake Dibeler, choreographer and performer. Alexander D’Agostino, sculptor and dancer. 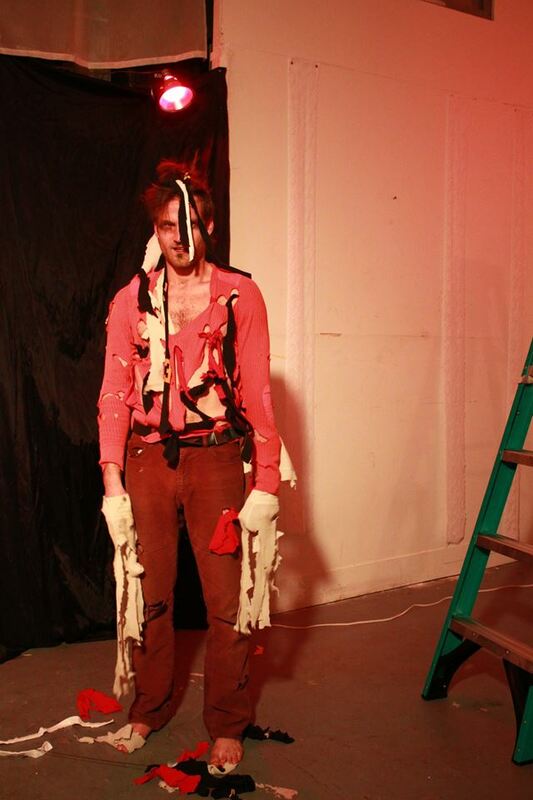 Person Ablach, installation artist and performer. Lee Cata as Alex Vizzi, performance artist. We ask for a donation to support the space and the artist, $1 to $10, in the hat.